Paintings and sketches done on my iPad and iPod Touch. After doing the comparison of analog vs digital collage, I decided to experiment more with digital collage to see what else was possible. I looked through my image collection for a landscape that was contrasty and had a limited number of colors and found this one that I did a few years ago on my iPod Touch. I pulled it into a layer in Inkpad, which is a vector based app on the iPad, and outlined the major shapes in another layer. This allowed me to alter the shapes and fill them with colors. I exported the image and modified it using a number of other apps. iPad 3, Inkpad, Sketch Club, Pixelromatic, iColorama, Image Blender, and Photogene apps. 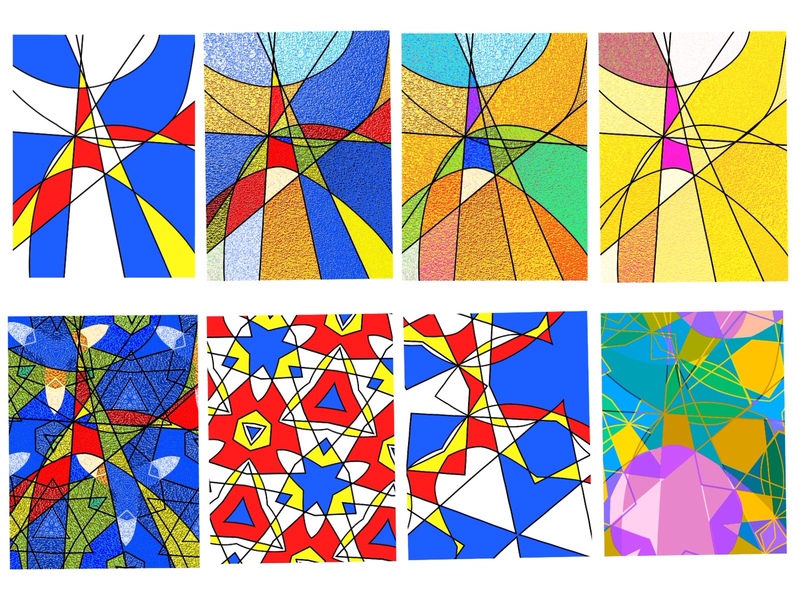 These four works are the results of experimentation. 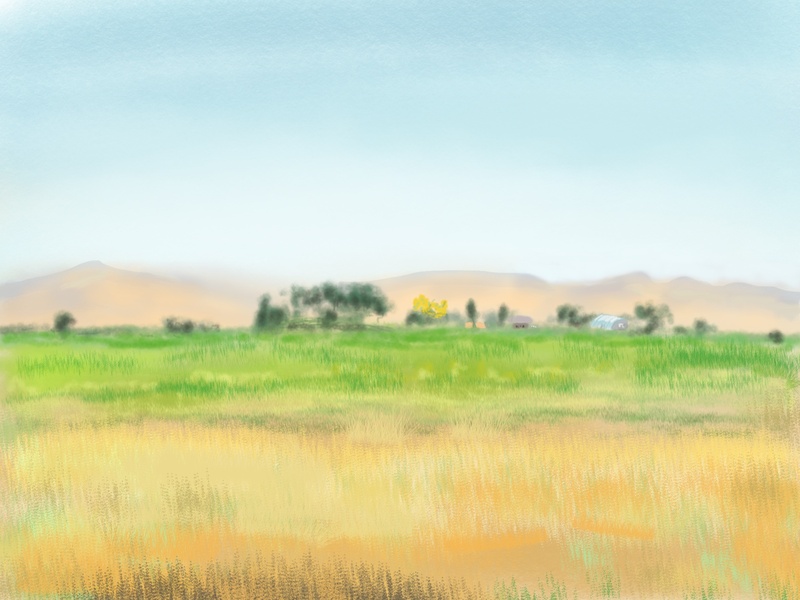 The first one (Meadowland) was started in Brushes Redux. I then experimented with filters and textures in iColorama. In the second one (Night Walk) I learned how to essentially paint a mask in Sketch Club. It takes two layers. I imported a colored texture into the top layer and set the layer’s blend mode to “On”. Then in the layer below I can paint with any brush to reveal the texture in the layer above. 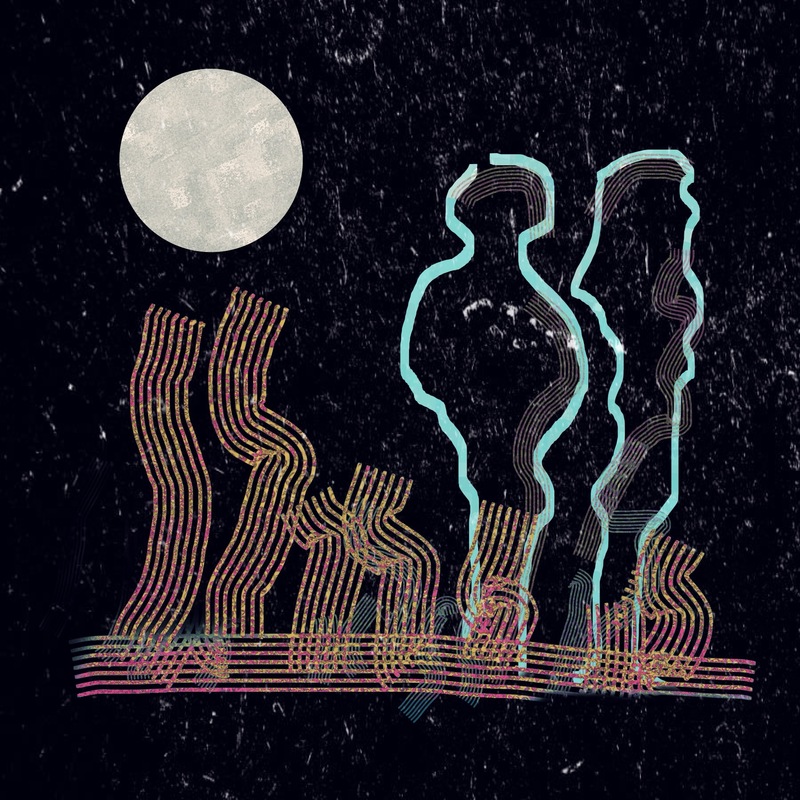 I did this three times (for a total of six layers) using three different colored textures made with NPtR on the iPad – a light blue for the outline of the figures, gray for the moon, and red, yellow and magenta used in the raked lines. Finally, I saved and opened the Sketch Club image in Pixlromatic and added the white noise. The third image (BIG) was done the same way. I experimented with a variety of brush, text, and opacity settings in the mask layers. 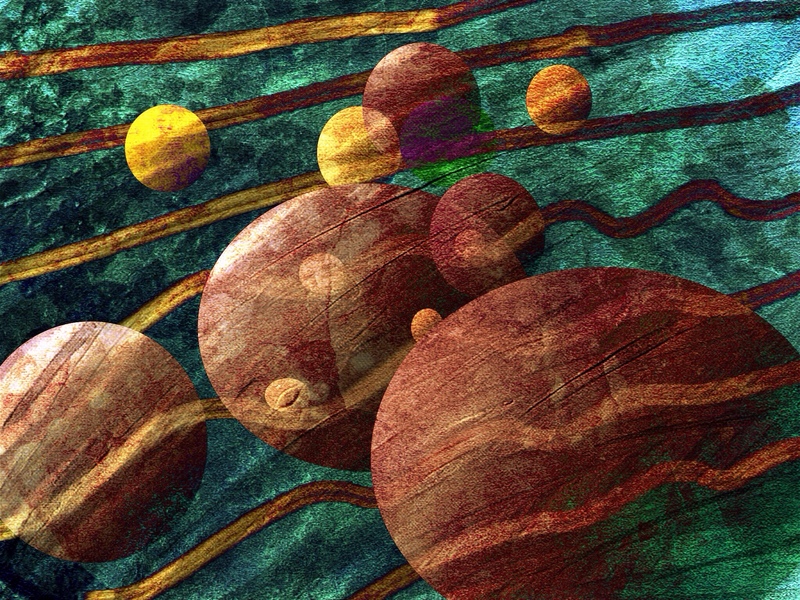 I used Procreate to do something similar in the last image (Dreamscape). I made textured marks with NPtR, opened the image in a layer in Procreate, and set the Blend mode for the layer (Difference) to reveal the marks over a background texture (also made in NPtR) imported into a layer below. When you truely experiment, the medium sometimes takes you places you had no idea existed. This was the case with this image and I want to show you the journey. I’m working on the iPad this morning with the iColorama app. Usually I import a photo or another piece of art and alter it, but today I wanted to use the brushes within iColorama to create a new painting from scratch. The program has a wide variety of brushes. I explored only two or three. I then opened the image in Pixlrama and altered the color balance and texture a bit. Finally I sharpened and altered the contrast in Photogene. 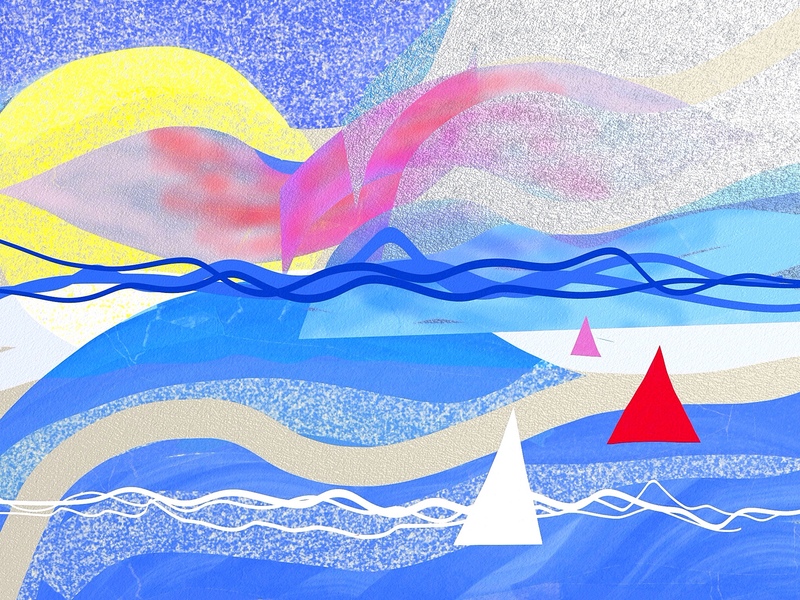 I”ve been experimenting with ways to get gradients into my art projects on the iPad. 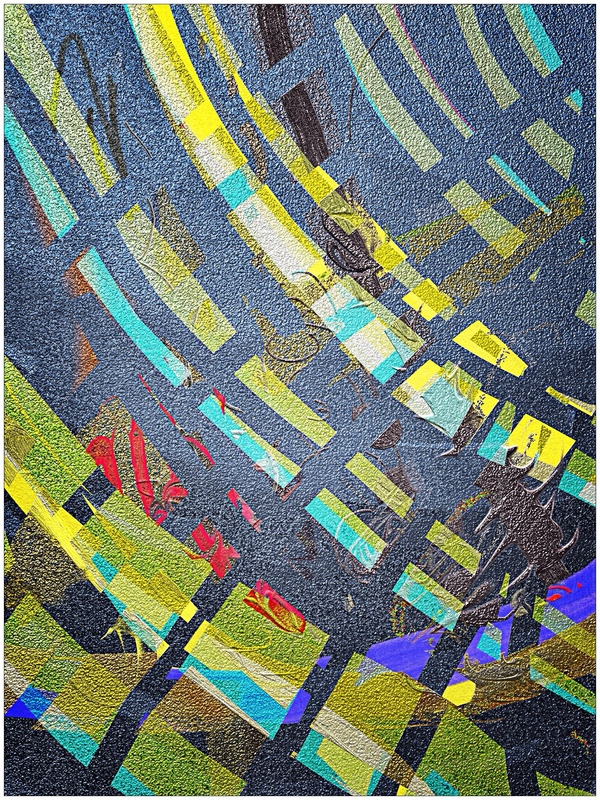 I started the above image in ArtRage and filled the page with a gold color on a textured paper. I then opened that image in iColorama and applied a gradient and another paper texture and saved it. 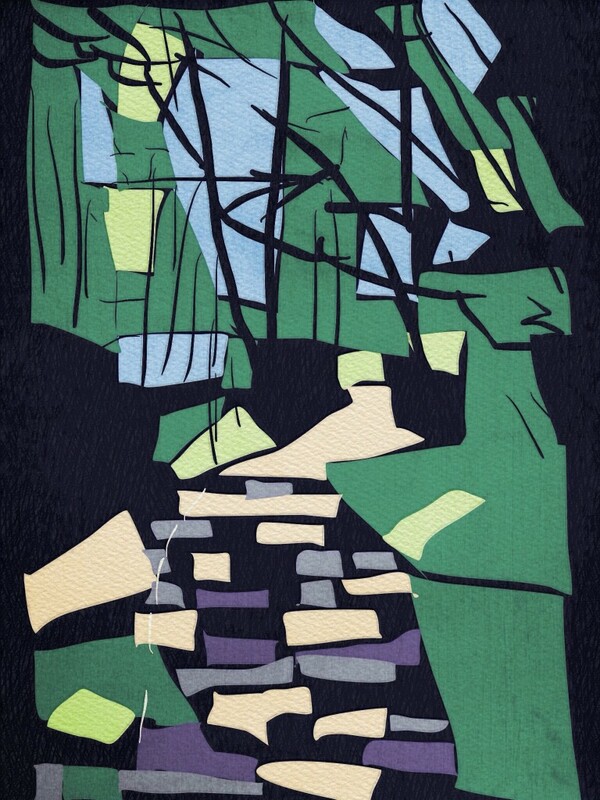 Next, I opened the iColorama image in Sketch Club and imported it into a layer. I copied that layer and used transform to resize and rotate it. I then used the eraser tool to create an interesting shape. I copied that shape into another layer and offset it behind the original shape and set the blend to Difference. I also copied the original paper texture, resized it with Transform, rotated it and placed it behind the two shape layers. 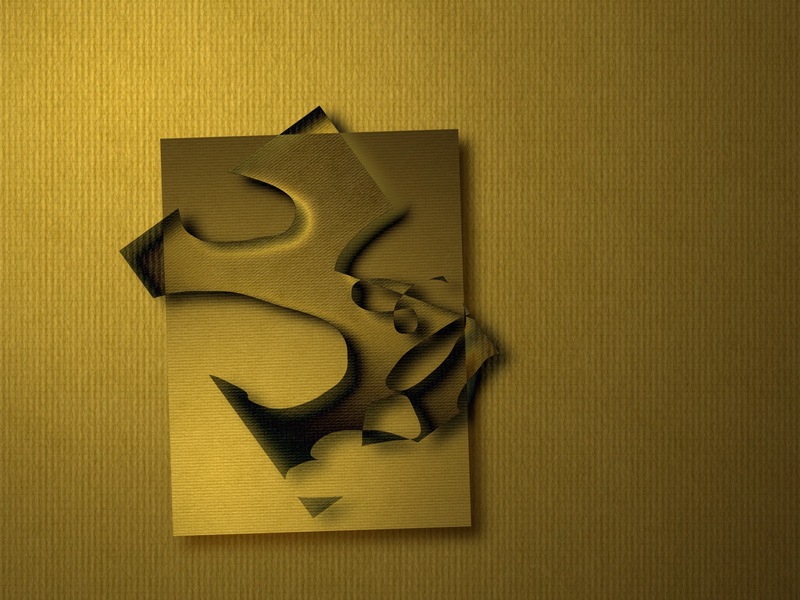 Finally I copied the small paper texture layer, blurred it, and moved it over a bit to create a drop shadow. I like the textures, colors, and gradients of this one. Since breaking my ankle I haven’t been able to get out on location to do any paintings. So, I’ve been working on the iPad. It’s been a while. I’m having to re-learn techniques. 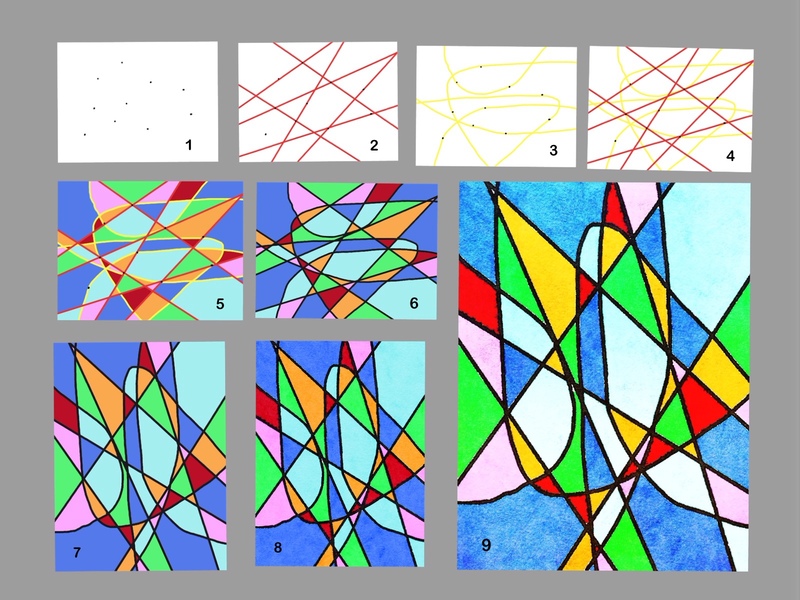 I did the above painting in ArtRage. It was an experiment in using metallic paints and the new Glitter tool. Below are other paintings I did. In addition to using ArtRage I also used iColorama, Distress FX, and Sketch Club. Five years ago I started drawing and painting on my iPod Touch. At that time I wrote an essay about the stages I went through using this new medium. I recently revisited that essay and discovered that it still rings true. Here it is. Note: All the illustrations were done on my iPod Touch over the span of one year (from March 2009 to May 2010). Click each one to see a larger version in my Flickr photostream. 1) Fun. You start by playing – making marks on the page just to see what happens. Everything you create at this stage is exciting. 2) Technique. Your interest is focused on “How do I get this stuff to work”? There’s a lot of frustration at this stage. I think most people quit at this stage or settle in to using a few “tricks” that work for them. It helps to study the work of others and try to duplicate their techniques. Eventually you discover ways to get the medium to do what you want, but it’s a struggle. 3) Possibilities. Everywhere you look you see paintings. Now that you know the basics of how the medium works you can see how to represent the world in this medium. This gives you a deeper understanding and appreciation of the world. You have so many ideas you can’t do them all. This stage is very exciting. 4) Construction. You realize that art requires planning. You focus on composition and learning ways to lay the image out and build it up. 5) Exploration. You test the limits of the medium to see how far it can go. Along the way you discover new techniques that allow you to do things that you couldn’t easily do before. 6) Subject. You realize that painting takes time and effort and decide that you want to spend your time learning about and working on subjects that matter to you. You think about the people, places, and things that matter in your life or that interest you to the point that you want to explore them further through the analysis and discovery that is painting. 7) Mood. You move beyond wanting to capture the physicality of your subject to wanting to convey how you feel about the subject. 8) Imagination. You become interested in using art to convey ideas or to construct things that never existed before. 9) Approval. You go through a stage of wanting to gain approval or recognition from people you respect. You are tempted to alter your work (choose subjects or use techniques that you know others will like). 10) Voice. You go your own way. You depart from the norm and discover new territory. You tell your own stories in ways that only make sense to you. As with other forms of development, it’s complicated, messy stuff. Not so much stages or steps, but pools of experience. Creativity requires both analysis and passion. I realized recently that the first and last pools (Fun and Voice) produce similar kinds of work. It took a long time to cycle back around to the place where I started, doing what I want, just for fun. Here’s a bit of fun on a rainy day. I used my iPod Touch to take a picture of the “Connect the Dots” puzzle in today’s Uncle Art’s Funland in the Sunday Comics in the newspaper. 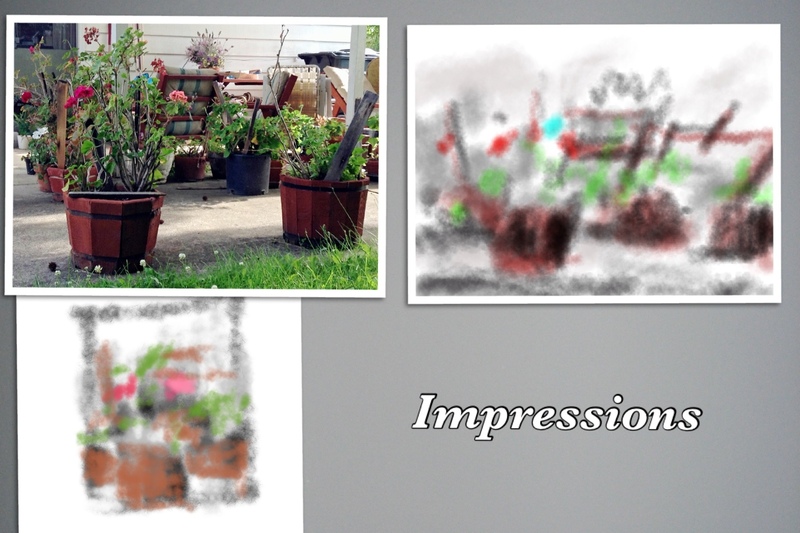 I placed the photo in Sketch Club and marked the dots in another layer. I drew lines between the dots by the numbers to complete the puzzle. 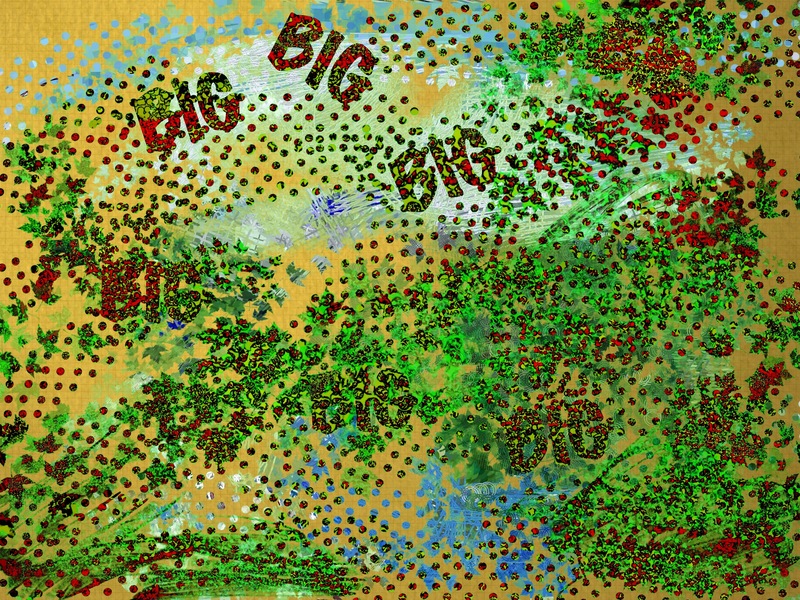 Then I thought it would be fun to use the dots to make other paintings. So, in additional layers I drew alternative versions and colored them in. Same dots, different interpretations. This is a variation of my 10 Point Construction experiment of creating something out of random dots. I woke up with a question. 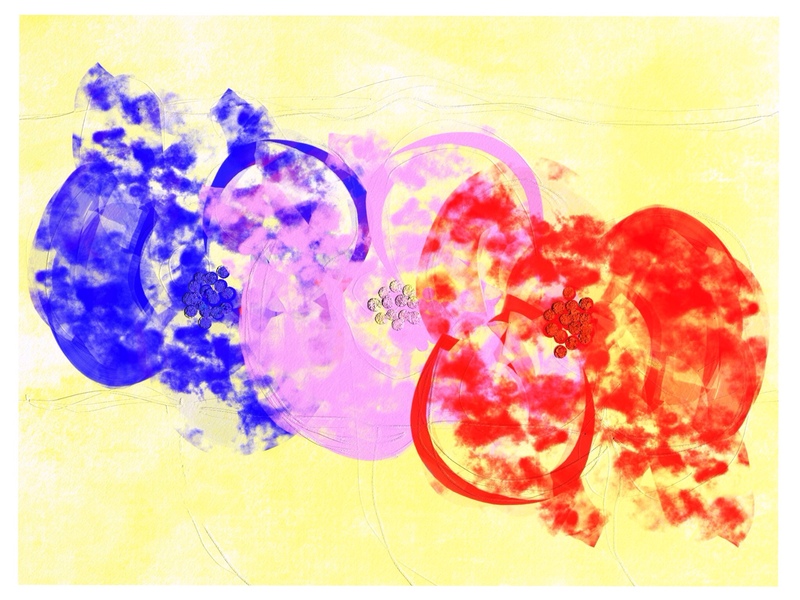 “Can I create a painting starting with randomly placed dots?” I then laid there thinking through the mathematics. “For any number of points, n, how many lines can you draw between them?” It turns out to be a simple progression. 1+2+3+4…(n-1). I also realized that you can draw an infinite number of curves through any two points. 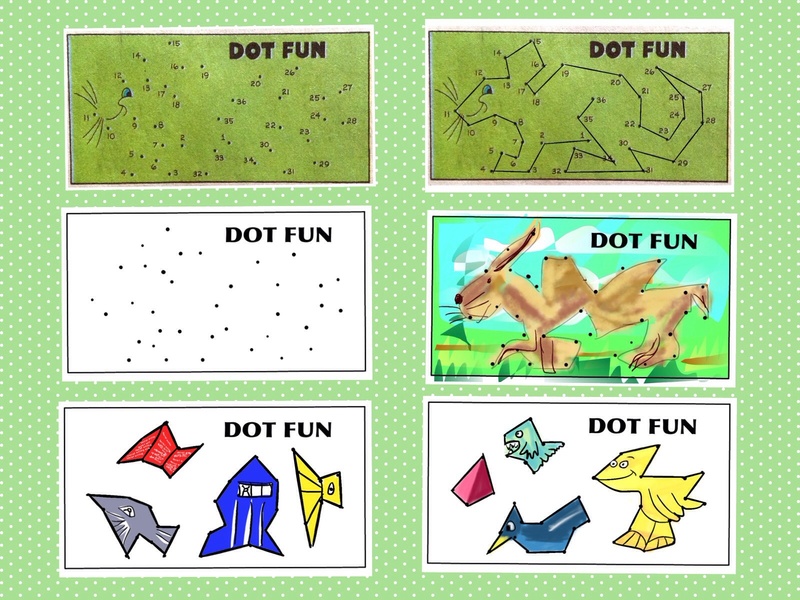 There are a lot of possibilities with just a few dots. I decided to try 10 dots. You can draw 45 lines through ten dots. So, that gives you a lot of choices. I used the Sketch Club app on my iPad to try out the idea. I first made 10 random dots in one layer. In another layer I drew 7 lines through pairs of dots. Notice I used just a subset of the 45 possible lines and I didn’t use all the dots. I hid the lines and drew 5 curves in another layer. This time I used all 10 dots. I showed both the lines and the curves. 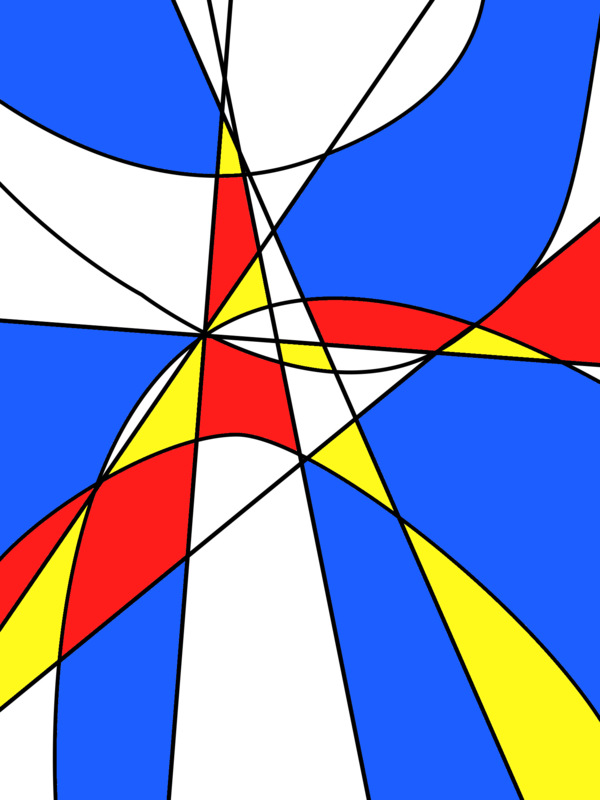 I filled the areas between the lines and curves with six colors. 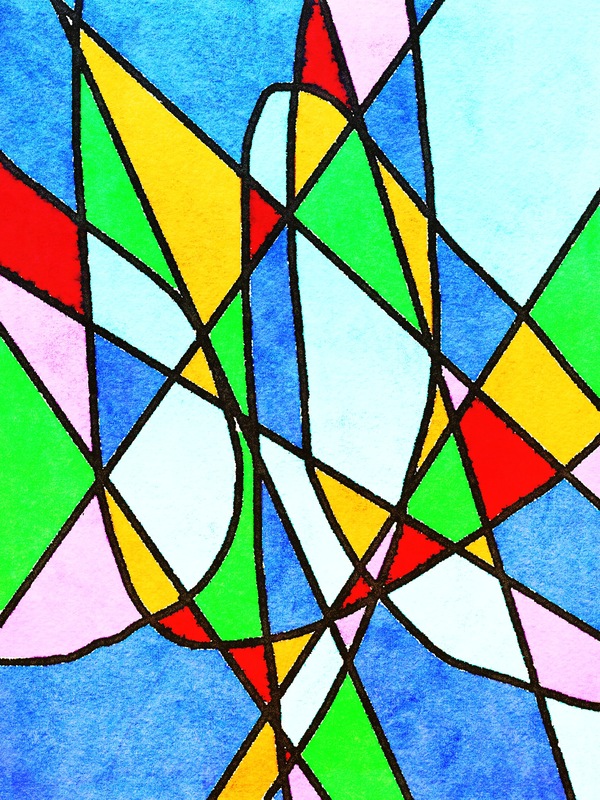 I colored the lines and curves black. I turned the canvas 90 degrees counter clockwise. 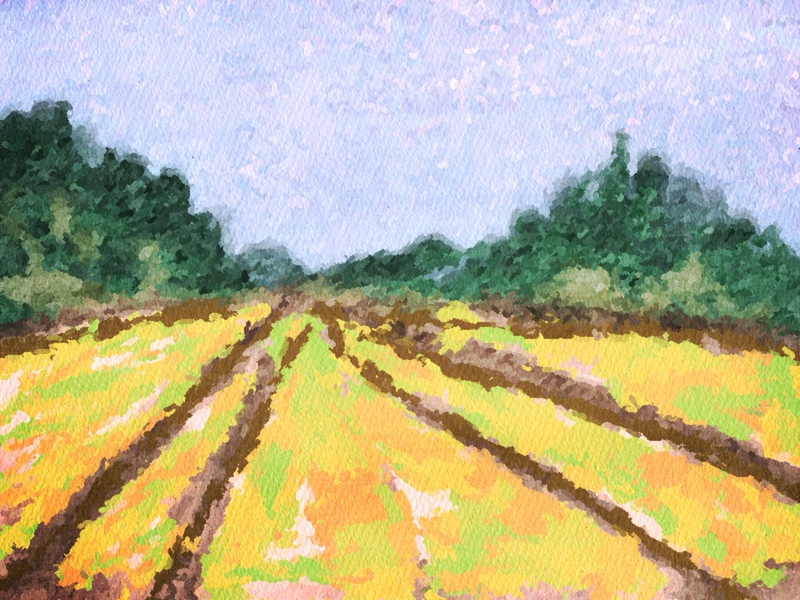 I used the Waterlogue app to add texture. I used the Distressed FX app to alter the contrast and color balance and to add a little more texture. Here’s the finished first experiment. Next I used the same 10 random dots in another application. Inkpad uses vector graphics. It’s easier to create lines and smooth curves. I then used Sketch Club to fill in with color. The next day I tried some additional variations. 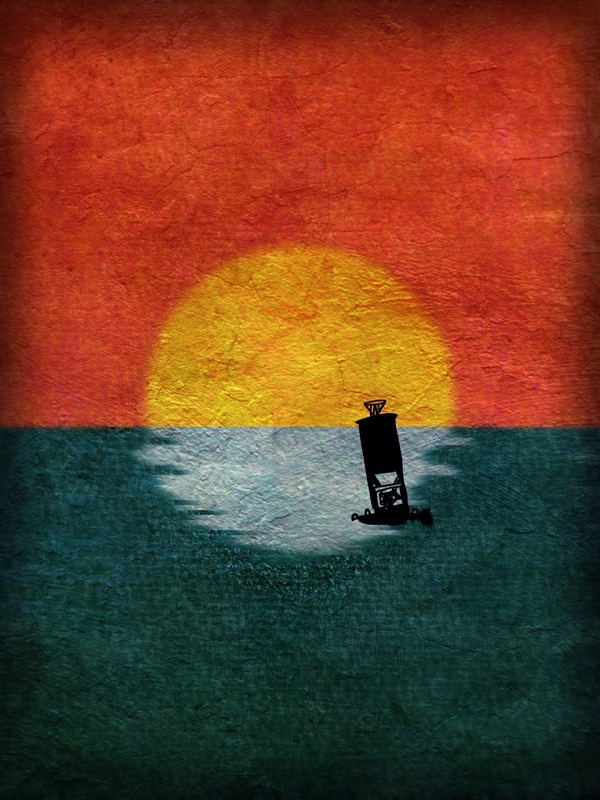 I added a texture, I varied the colors, and I tried the kaleidoscope filter. Conclusions: I found this to be a good creative exercise. It’s an expansion of “doodling and noodling” where you start with something random and then make something out of it. All media evolve from a series of creative choices that take you in directions that you didn’t know existed when you started. It’s important to practice exploring without fear. Digital media allow you to explore a variety of choices. This process of building on randomness is one that can be generalized and used in other media. Any creative work is a combination of chance and choices. We need to embrace chaos, trust our judgements, try many variations, rest, review our work, and (if necessary) try again with renewed vigor. 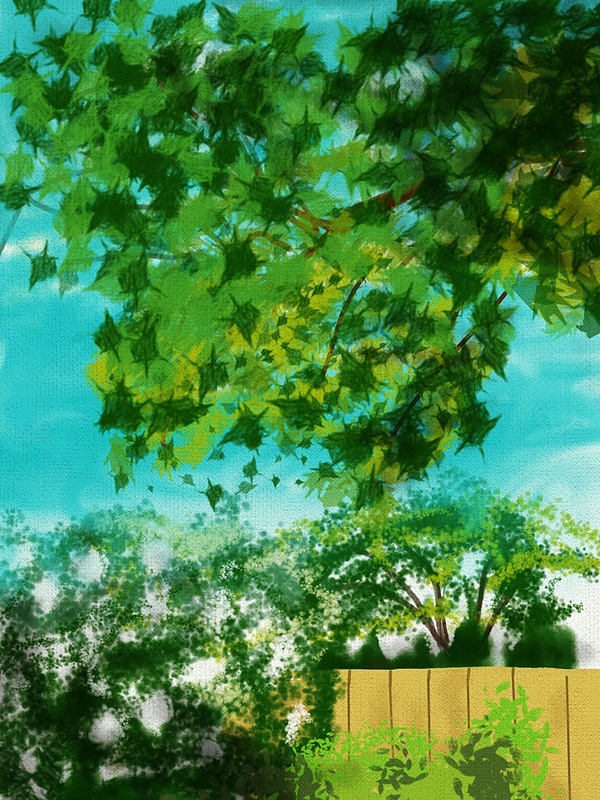 Sketched this looking out the kitchen window after breakfast. Overcast, light wind, threatening rain. iPad 3, Procreate and Photogene apps. Here’s a photo of what I saw. I took this after doing the sketch. Procreate also makes a movie of the strokes used in making the painting. 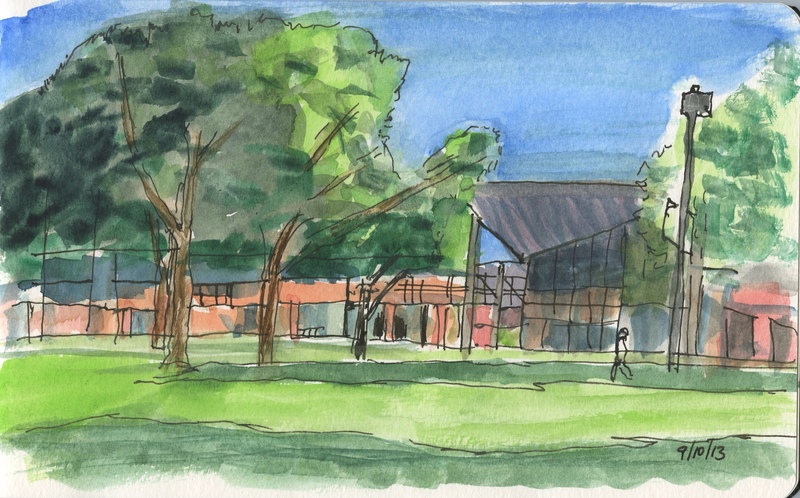 Today I went over to my old stomping grounds – Chemeketa Community College – to do a sketch. It was a beautiful day and I wanted to test out my new work method. I started by taking a picture with my iPod Touch using the ProHDR app. 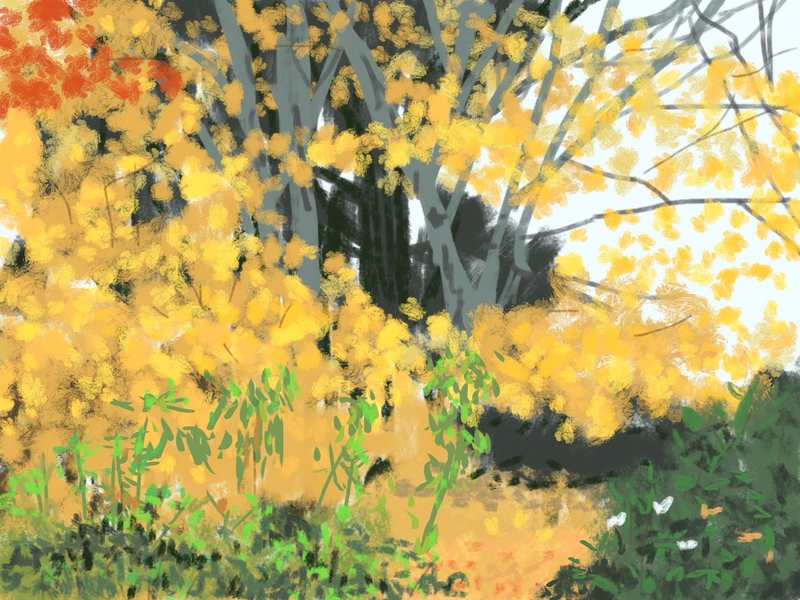 Next I used ArtRage on the Touch to create a quick color study working from the photo. I then used Photogene to drop out the color to create a value study. I used the value study to draw the major shapes in my watercolor notebook. I used a Pilot FriXion erasable pen so that I could erase the initial placement lines later if I wanted. Then I drew with my Mars 500 technical pen with Noodler's Bulletproof black ink. As I drew I looked at the scene to see the detail. Finally I added watercolor using a small flat chisel brush. I looked at both my color study and the scene before me to determine the colors. There's no way to know what the sketch would have been like had I just jumped right in and started sketching without the preliminary iPod Touch studies, but I feel they helped with the layout and color choices and they got my creative juices flowing. I'm always looking for ways to explore a subject before I paint it. I like to walk around and look at different angles and distances and consider various compositions, value and color schemes. It takes me a while to warm up. My second or third sketch is usually better than the first. 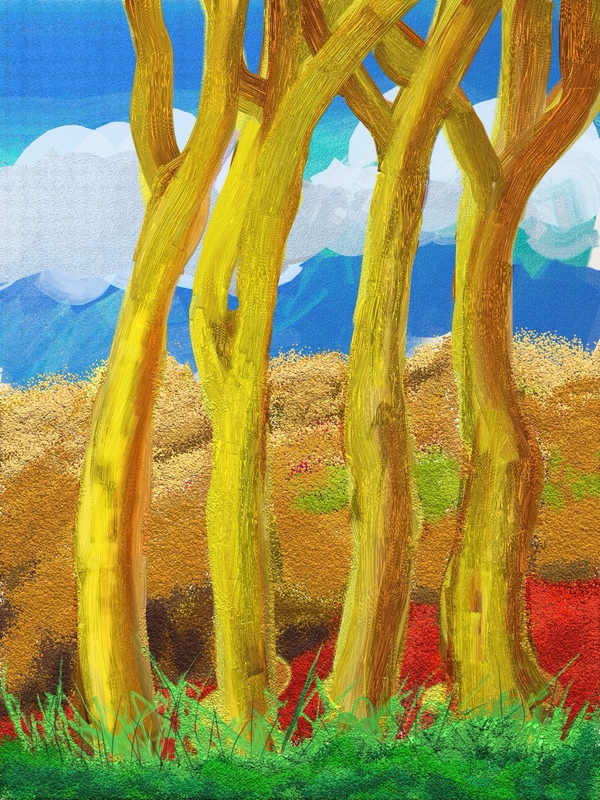 I'm experimenting with using the iPod Touch for these preliminary studies. I'm looking for a method that's fast and easy and flexible and convenient but above all helpful. Here's my first try. 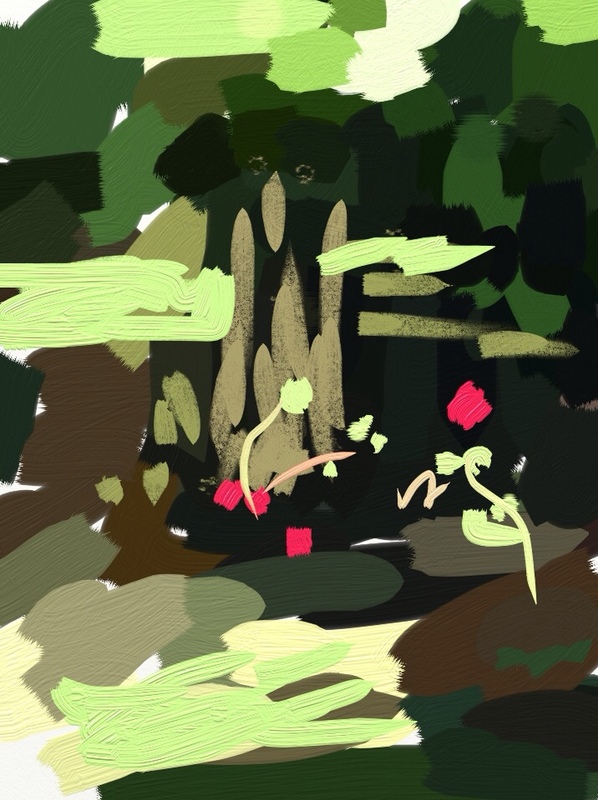 This was done with ArtRage. I took a tracing picture and used the picture's colors to do this quick value and color sketch. I added in some color and detail in the deep shadows that the eye can see but the camera cannot. This worked pretty well and is fast. Next I wanted to try starting with a HDR (high dynamic range) photo to see if I could capture detail in both the shadow and highlight. This could potentially save me time painting in areas that the eye can see but that the camera usually misses. This next image started with a picture taken with Pro HDR. I can also drop out the color to see the values. I wanted to try Artists Touch and compare it to ArtRage. 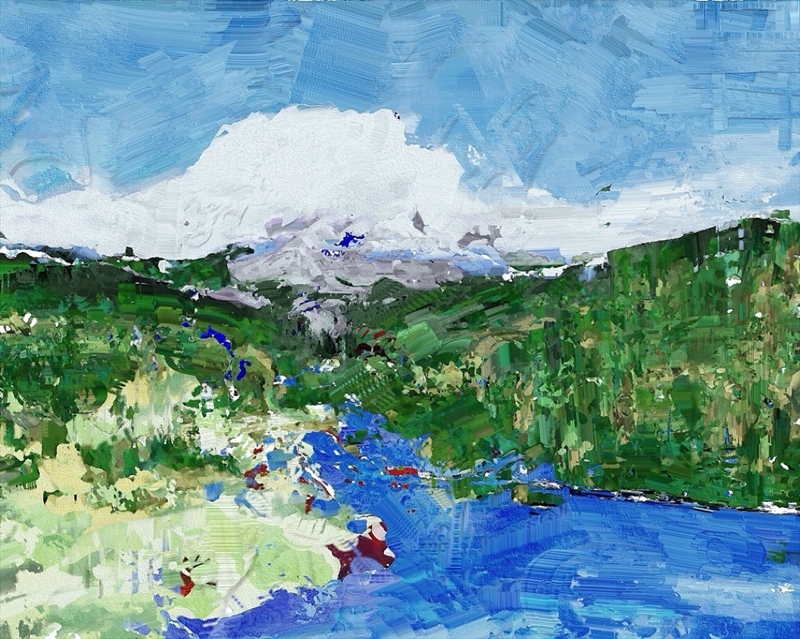 ArtistsTouch is faster, but I prefer ArtRage. Artists Touch doesn't give me the information I need. It just ends up looking like a blurry photo. 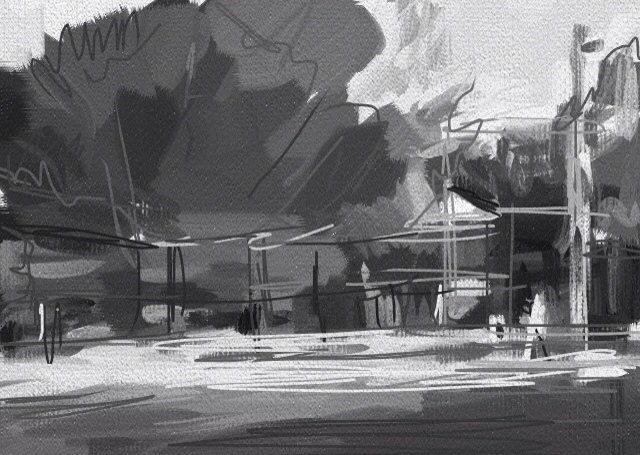 With ArtRage it feels like I'm actually laying down paint with my finger. It works to warm up my hand eye coordination and creates a kind of muscle memory. So, here's the method I plan to use the next time I paint on location. Walk around and explore various possibilities with the iPod Touch's camera. 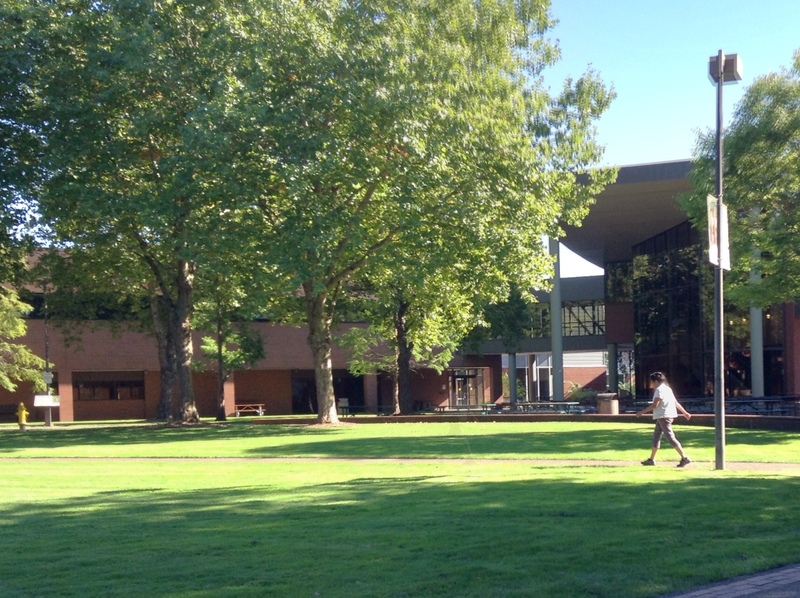 Pick a position and take a picture with Pro HDR. 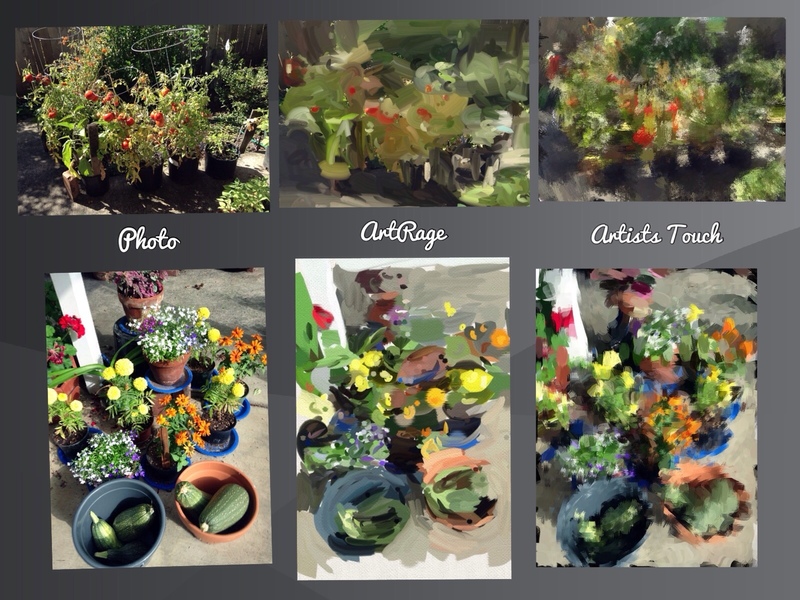 Use ArtRage to sketch a quick color study and Photogene to drop out the color and check the values. Use a Pilot Frixion erasable pen to block in the major shapes and perspective lines. These marks can be erased later with a hair dryer. Refer to the studies and photos to get the composition, proportions, and perspective right, and people and other things that may move or change over time. Draw with waterproof ink and then lay in the color or apply color first and then add ink drawing as needed. “Failing to prepare is preparing for failure”. We drove all day yesterday to get here. We are visiting Kris’s brother and his wife. I sketched this sitting on their back porch. Time 2 pm, temp. 86 degrees. Done on my iPad in Sketch Club. I had to look hard to see the colors in the far hills. I think I got it. 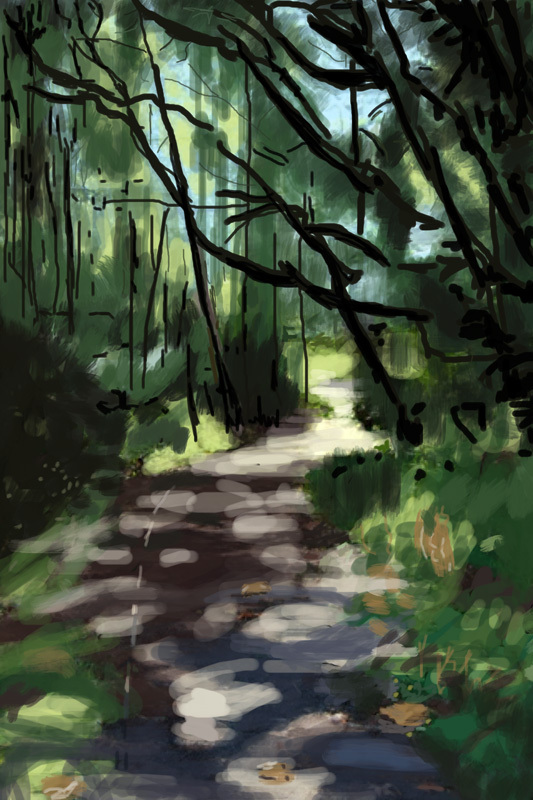 I’m continuing to experiment with using the iPod Touch to do location warm-up and value sketches. I sat in the hammock looking at the back porch and did two quick sketches. I did the first one in Sketch Club. It’s the little vertical one. 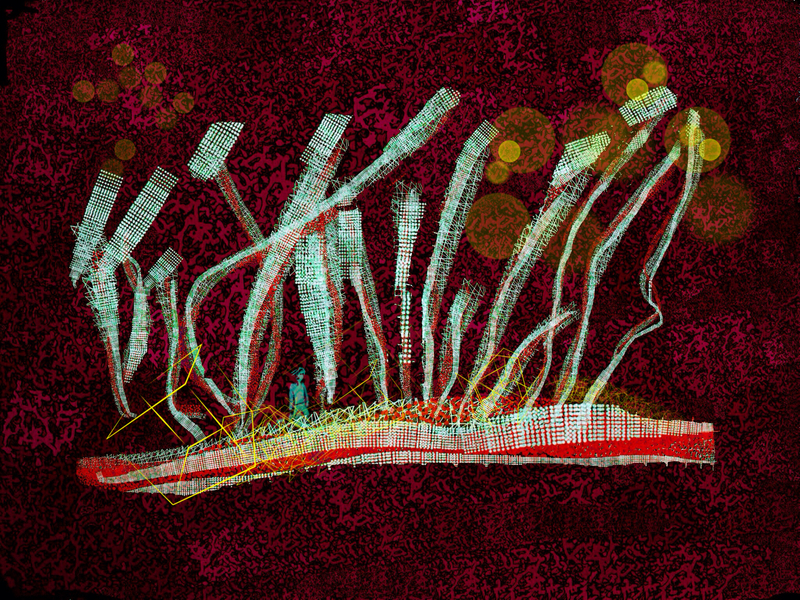 Next I used Brushes to make a horizontal sketch. In both I used a very soft, large brush. I started with black and sketched in the darkest areas. 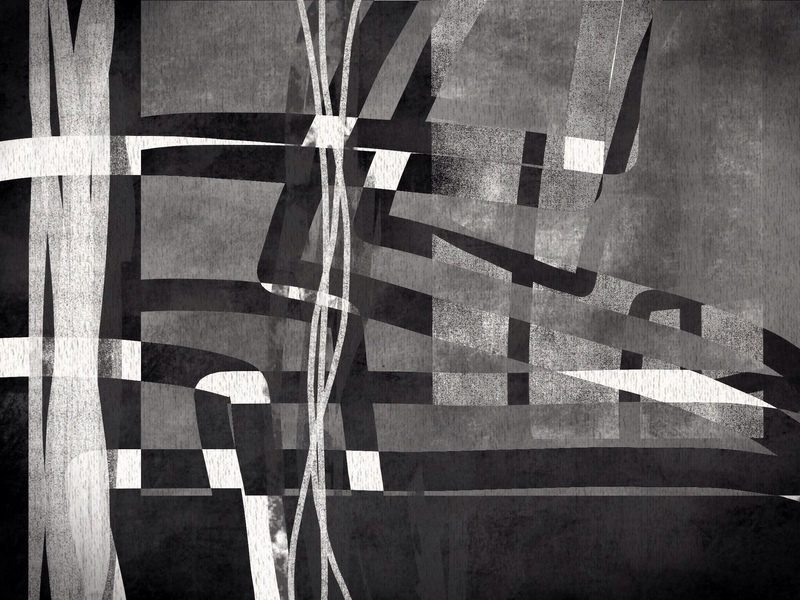 I then worked with midtone gray, light gray, and white. I added color in a second layer. The first sketch helped me in the second sketch. It improved my visual memory. I didn’t have to look up as often. I already knew the basic placement of forms and angles, values and colors. Sketching helps me remember what I see which is different than what a camera sees. Our eyes move from object to object. We piece together information to form an understanding of what’s in front of us. Sizes, values, colors, relationships are interpreted rather than recorded. 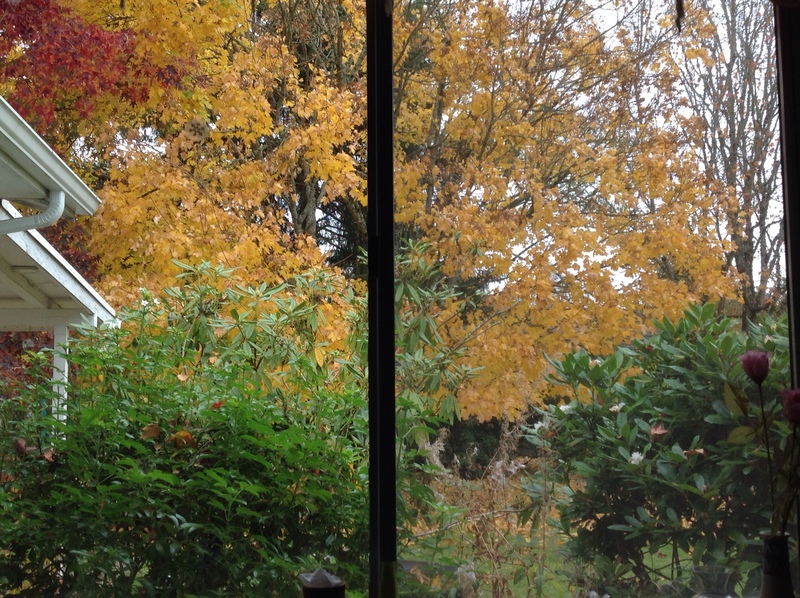 We see a greater range of values and colors than a camera can record. Notice how dark and lifeless the original photo is. I had to enhance the color and contrast with Photogene to get it close to what I saw. Also notice that I had to zoom in and crop out a bunch of stuff. Next time I want to try sketching in a square. That will allow me to experiment with cropping versions to different formats. This is my first experiment with making custom brushes in the Sketch Club app on my iPod Touch. I found I could draw a custom brush shape on location and use it immediately. 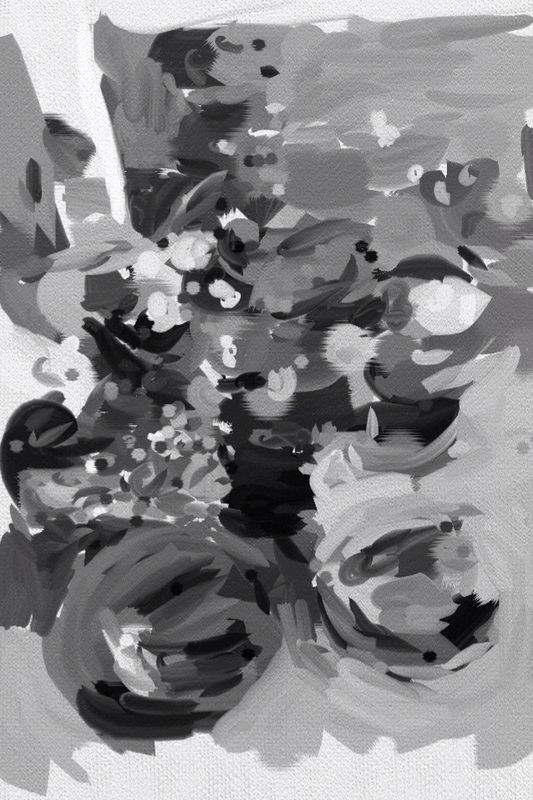 I made the maple leaf shape in black and white using Brushes (the app), saved it to my Camera Roll, and then loaded it into a custom brush in Sketch Club. 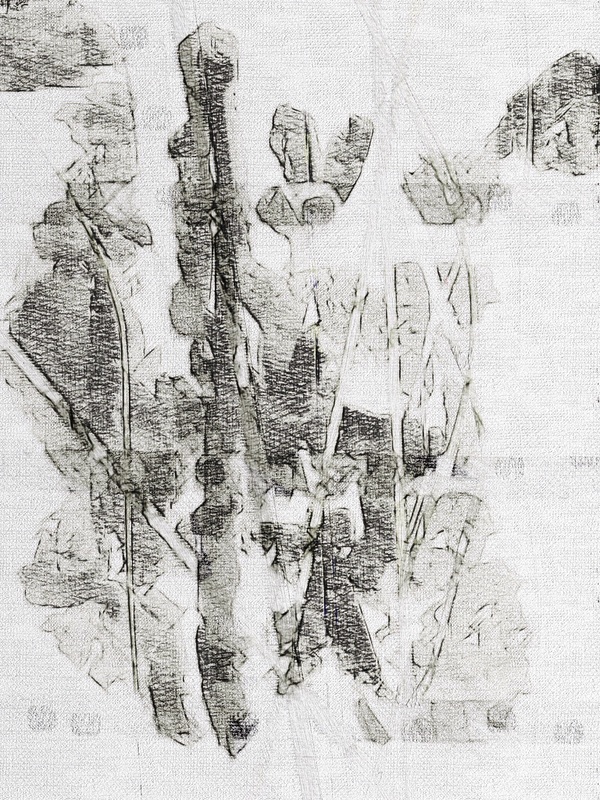 I also found I could add a canvas texture to the painting by importing the texture image into the top layer and setting the blend mode to Multiply.